← How the end of CeBIT reminded us of the remote desktop technology beginnings? ISL Online, also in 2018, delivered an enviable 99.9852% uptime and has yet again proven that a consistent and strong uptime is the lifeblood of an effective remote desktop service. Without a single major incident in the past year, ISL Online average cloud service availability has been improved to 99.9827%. To its customers with a SaaS license, ISL Online guarantees 99.95% uptime within the Service Level Agreement. Among main reasons why businesses usually prefer SaaS to self-hosted solutions are greater reliability, security and automatic updates. 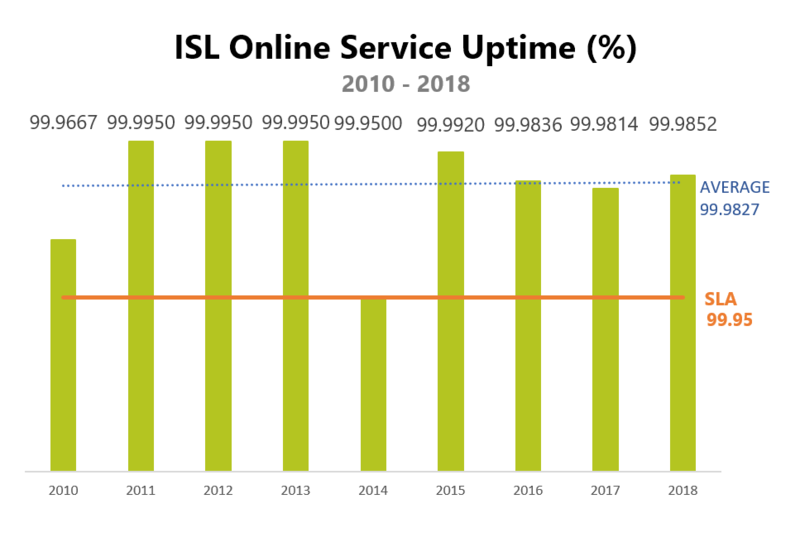 In 2018, ISL Online recorded 22 minor incidents all related to http://www.islonline.com availability, while http://islonline.net, hosted on a separate set of servers, has performed at 100%. ISL Online remote desktop services were thus available day and night throughout 2018, whereas the website accumulated 78 minutes of downtime but never more than 10 minutes at the time. All of the users who wanted to start remote desktop service through the website during its unavailability were automatically offered an alternative login page hosted by the ISL Online network and have started the session there. However, the web downtime caused temporary unavailability of certain functionalities such as user management, etc. 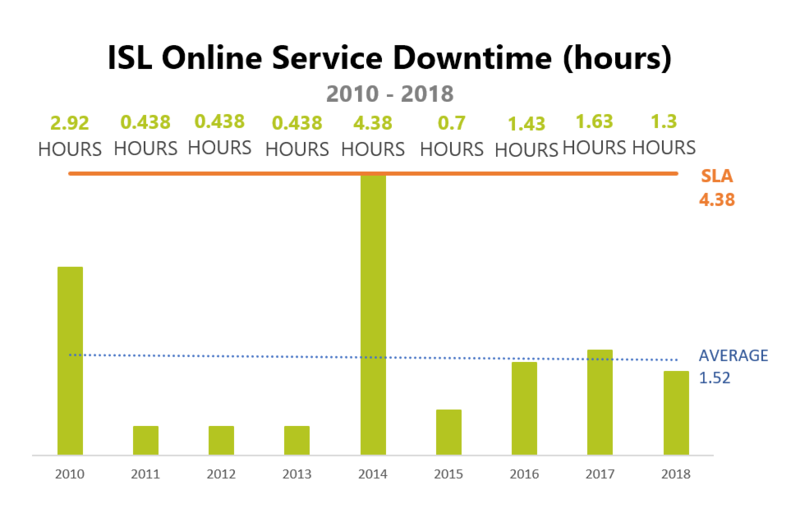 ISL Online finished the year with 20 minutes less downtime than in 2017, and three hours less downtime than the guaranteed SLA. In 2018 ISL Online remote desktop services were available 24/7 without a single minute of downtime! ISL Online’s global network, through which millions of SaaS remote sessions are established, has reached the highest of all availabilities and performed at 100%. At ISL Online we are proud to have been able to keep the network of over 80 servers located worldwide alive all year round and guarantee our customers an intact business continuity through a reliable and performant infrastructure and service. ISL Online serves customers in virtually all industries throughout the globe. While all companies demand a reliable remote desktop service, some of them, operating in sensitive fields like hospitals, banks and governments have the highest expectations when it comes to the operational performance of the software. They require a high availability service to maintain their critical systems. ISL Online’s global network, which hosts all of the sessions our customers with a cloud license establish, is a meticulously designed, high-availability system with redundancy built into its core architecture to mitigate against failures. The system is developed to the highest standards, rigorously tested and operated with precision. “Minimizing downtime and service interruptions has always been a high priority at ISL Online, even when high-availability was not such a popular buzzword in the world of IT as it is today. In 2018, ISL Online services running on the ISL Online network were 100% available and we will continue doing our best to keep it this way,” points out Jure Pompe, CEO at ISL Online. This entry was posted in customer service, service uptime and tagged downtime, HA, high-availability, ISL Online cloud, ISL Online network, reliability, remote desktop services, saas, SaaS availability, SaaS uptime, service availability, service quality, SLA, uptime. Bookmark the permalink.